These tricks should lead to a better night's rest. People have no sympathy if you’ve got a cold. You’re sneezing, sniffing, snotty and generally feeling awful, but the world wants you to crack on. And while there are many over-the-counter remedies for the sniffles to get you through the day, when it comes to sleeping at night, it’s a whole different story. "Although you may feel you have to stay warm at night, fresh air is good for sleep, particularly when you aren’t feeling well," says Dr Stanley. "My advice is to open the window before going to bed, even if it’s just a tiny bit. By opening the window, you lower levels of carbon dioxide in the air, which has been shown to improve the quality of sleep." "If you have a cold, you’re not going to be much fun to sleep next to. 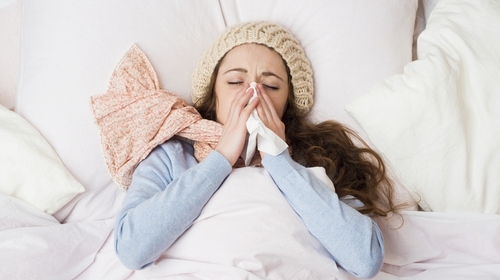 Your raised temperature and the discomfort associated with a cold will mean you are more restless throughout the night. The coughing, sneezing, wheezing and blowing is bound to be disruptive and therefore, it may be beneficial to you and your partner if one of you sleeps in a different room for a couple of nights." "Make sure you have a glass of water beside your bed to sip from during the night," advises Stanley. "One of the main problems with having a cold is the fact the blocked nose is liable to cause you to breathe through your mouth, resulting in dryness. Having water beside your bed means you can sip it throughout the night to relieve mouth dryness, and keep yourself hydrated." "You need to lose body heat to get good quality sleep and you lose this heat from your head and face, as that’s the only bit of you that is exposed under the duvet. While you can be as toasty as you want under the covers, the bedroom needs to be cool – the ideal temperature is between 16-18C. When you have a cold, you’re already going to find it more difficult to lose body heat, because you’ll be running a temperature. Having the bedroom too warm at night will make things even more difficult, so resist the temptation to turn up the heating." "Ensure you have any medications you might need close by your bed," notes Stanley. "This includes painkillers, sore throat pastilles and a medicated rub – which is clinically proven to help relieve common cold symptoms for a better night’s sleep." "Have a warm bath before bed, as it will relax you and help you to sleep better. When you have a cold, the stresses and worries of modern life feel even worse, so soaking away your worries in a nice warm bath is an ideal way to wind down and prepare for bed." "When you don’t feel well, sometimes you lose your appetite. However, it is important not to go to bed hungry, as that will disturb your sleep." Dr Stanley suggests eating a couple of slices of hot buttered toast for supper, as while your body doesn’t want to be processing a big meal during sleep, the feeling of hunger causes the brain to want food not sleep, and this may wake you in the night. "A hot ‘toddy’ of honey, ginger and lemon is a soothing, relaxing drink that can help you get off to sleep," notes Stanley. Be aware that some cold and flu remedies can contain caffeine. Although this can help you feel better during the day, too much could disturb your sleep, says the doc, especially if you’re also getting caffeine from tea or coffee. "Difficulty breathing is a common symptom of a cold and one that can potentially cause sleep problems, as well as contributing to snoring. Try and keep your airways clear by using a suitable decongestant product and keeping tissues handy at all times." A study conducted by the Surrey Sleep Research Centre has proved that Vicks VapoRub can offer a better night’s sleep when used when suffering from a cold.